It's back! Free to play Tour de France predictor game. Lucky 7: Tour de France, the brand new game which gives you the chance to put your cycling knowledge to the test, compete against mates and win tons of free bets. So get on your bike and sign-up now with Coral! Coral will be running daily & weekly prizes for entrants to win a share of our £3,500 prize pool. The aim of the game is to accurately predict which of our three chosen riders or teams will finish highest in all 21 Tour de France stages. It couldn't be simpler and as usual it's completely FREE to play! Remember all Lucky7 winnings will be instantly doubled providing you are a Coral customer! Find Lucky 7 Terms and Conditions at Coral.co.uk. 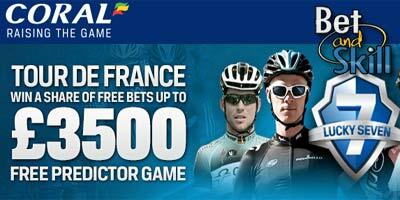 "Coral Lucky 7: Free predictor game on Tour De France. Win up to £3500"